I haven’t seen a Mach Pizza Air Freshener for sale in a long, long time, so if you’re interested in picking one up, one recently showed up on eBay here! 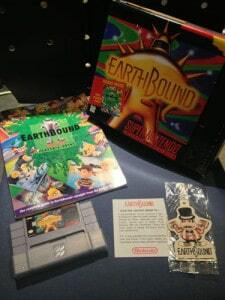 I’m guessing the seller would prefer to sell it with the complete copy of EarthBound. That might put it out of a lot of people’s price range, but maybe he’d be willing to sell it separately if you ask, I dunno. If anyone gets it, let me know if the air freshener still smells! So much marketing that didn’t go well… What is a kid in the 90’s to do with an air freshener? Make his/her room smell faintly of pizza? I dunno I think that’s pretty awesome. Too bad its already got 19 bids, he might have sold it separately. If someone really wanted it I would buy the whole thing then resell the complete set unless you either didn’t have a complete set or the one on the auction was in better condition. That one looks pretty minty though despite the missing s&s card! ^Have you told your mom how much it’s worth now? If so she must be really kicking herself in the back now. One of the greatest icons in the history of EarthBound’s quirkiness. I’m so happy to see that at least some of them have resurfaced. hate to part with it but need to scronged up some money for that ness figurine lol just to let you know it doesnt smell like pizza nomore still in wrapping don’t know if i opened it or not. if you sell yours will it come with the note? nope no note didnt know the item would have such a demand for it. i got the mach pizza air freshener sealed in package with congratulation note and the envelope it was mailed in mine also came with a iron on Mario patch that says i saved the princess ? im gettin ready to post it on ebay but not quite sure about the patch. it came with the mach pizza freshener but should i list it seperatly?